18 holes, par 72, 6649 yards. Links. Situated in Southport, just 4 miles north of Royal Birkdale, you will find an absolute gem of a course - Hesketh Golf Course. Established in 1885, Hesketh is the oldest club in Southport and regularly used as the final qualifying round when The Open is being held at Birkdale. 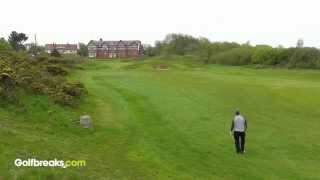 Whilst Hesketh is primarily a links course, it has evolved over the years to feature traits of a parkland course. Probably the most distinctive feature of Hesketh Golf Club are its tall sand dunes, and the perfectly kept fairways that meander through them. It may not be the most notorious course in the area, but it really does have some fantastic holes – none more so than the impressive 18th hole which leads you into the striking clubhouse. Visitors at Hesketh are extremely welcome and you will always be met with excellent service and a very well kept golf course. This is certainly one to consider for your bucket list! Golf carts are available from the golf shop for a price of approximately £20 per cart. Electric trolleys are also available from £8 and pull trolleys from £3. Like most traditional golf clubs, Hesketh adheres to strict golfing attire. Collared shirts must be worn at the very least and done so with smart trousers or tailored shorts.